If you’ve ever cleaned a bathroom, you know how tough a job it can be to do right. 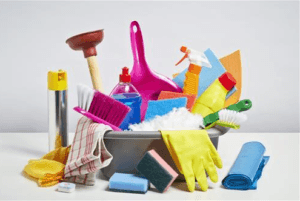 Aside from the regular washing and scrubbing it takes to keep surfaces clean, keeping tubs, toilets, and sinks clean often requires extra work, and extra powerful cleaners. While store-bought bathroom cleaners can usually get the job done, they can also be hazardous to your health, not to mention expensive. Thankfully, it’s possible to make bathroom cleaning products at home that cost a fraction of what store-bought cleaners do, and which are much safer, to boot. Why Make Your Own Bathroom Cleaner? They’re nontoxic – The bathroom cleaning products you buy at the store are usually made of a collection of potentially toxic chemicals. As such, they can be hard on the skin, not to mention dangerous to have around if there are kids in the house. It’s not just children who have to worry about health effects, either – some store-bought cleaners have chemicals that create hazardous fumes that are dangerous to breathe in. They’re cheaper – Quality bathroom cleaners can be quite expensive. Unless, of course, you make your own, in which case you’re paying much less for basic ingredients that do the job just as well! They’re ecofriendly – Another problem with hazardous chemicals is that they do damage to the environment. Homemade cleaners, on the other hand, can be made entirely from non-harmful ingredients, letting you go green while keeping clean at the same time. Pour half a cup of water into a standard spray bottle. Add one and a half cups baking soda, a half cup of liquid soap, and two tablespoons (tbsp.) of white vinegar into the bottle. Put the top on the spray bottle, and shake until the ingredients are fully mixed. Spray the surface of the sink, bath, or shower with the mixture, and then scrub with a sponge or hand towel. While the mixture above is great for your standard bathroom cleaning, sometimes you’ll need something a little stronger to take care of the mold that occasionally appears on the walls or shower stalls of bathrooms. In a shallow bowl, add a half cup of Borax and a half cup of white vinegar. Stir until the two ingredients mix into a paste. 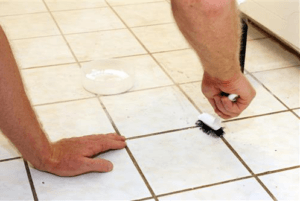 Apply paste to mold/mildew and scrub with a cleaning brush. Let sit for an hour, and then rinse. Pour one quarter cup of baking soda and one quarter cup of white vinegar into the toilet bowl. Let mixture sit for 30 minutes. Scrub with a toilet blush, and then flush when cleaning is completed. Contact American Bath Enterprises to learn more about our ADA-compliant shower stalls and other shower/bath units. Call today at 888-228-4925.